Building, extending or fixing a wire fence? Outperforming traditional post systems, preformed Insulated Large TwistEnds cut installation time in half and save you money. 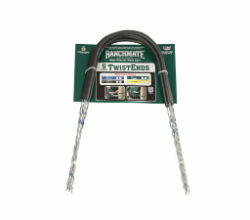 Sturdy and durable, TwistEnds stay in place making for a strong, secure fence. Insulation helps prevent wear on fence posts. Manufactured from galvanized steel (Class 3 and above) All TwistEnds are conductive. Patented technology.